Fun fact: you’ll be surprised at how many people in the fashion industry are KPOP fans! Sooooooo manyyyyyy! 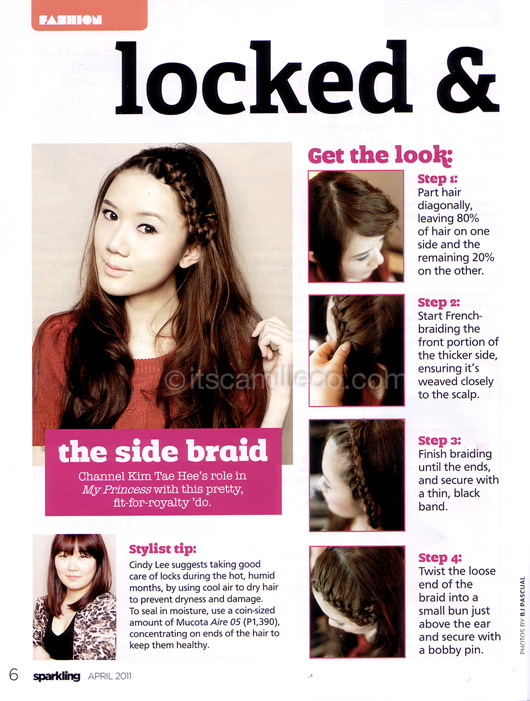 Modeling the side braid. I’ve actually been doing the hairstyle since way back and I love it! I recommend the ‘do for long days or when your bangs don’t fall the way you want them to. Go ahead and try it! The shoot took place at Park Jun, the salon I go to! Too bad it wasn’t my stylist, Jinny Kim, who made me up (although she did help out, which made me love her even more). Nonetheless, Katie and Cindy did an awesome job. I loved my hair and make-up that day! Korean make-up always looks so effortless, dewy and fresh. I don’t know how they do it! But I did learn a trick or two! Like for my lips, Katie used a close-to-bright-red lipstick. Initially, my heart skipped a beat when Katie whipped it out because I thought she was going all out! I really can’t, for the life of me, pull off red lips, no matter how much I want to. But then Katie started applying it on the center of my lower and upper lip. She then got a lighter shade (close to pale) and used that to spread the color, dabbing from the center outwards. Voila! Sweet lips! Koreans and their ways. SO COOL! I had my hair permed at Park Jun’s and it ended up more damaged. I went to their salon last October to have my hair permed but they said that my hair is too damaged that I need to have my hair treated. So I availed of their promo – the Mucota Treatment which cost me almost 20K for six sessions. I noticed that my hair became healthier so I even bought their Home treatment. After the sixth session last November 30, they said the next time I go back, I can have my hair permed already. Last December 8, I went back to Park Jun’s and asked if they can already have it permed (as I always do). The senior stylist checked my hair and gave it a GO so I was happy. They said I need to have it treated AND permed that day so I agreed. So they did all the rituals… and after 6 hours of waiting, my hair is ready for rinsing… The assistant talked to me and told me that the perm did not really had an effect because my hair is too dry… So I need to have it treated and I need to do the maintenance which involves twisting my hair every now and then to have the “permed” effect. The senior stylist talked to me and said that my hair is too dry I need to have it cut — Whaat? After all the money I spent to have my hair treated they will say the reason why the perm did not take effect is because my hair is “too dry?” After all the money I spent for the treatment, the recommendation is to have it CUT? I even asked them if I can have it permed… If they said NO, I wouldn’t force it anyways… I was planning to go back to their salon to have my hair fixed again because in the first place it was their salon who treated my hair and then have it damaged because of the Perming process. I will check with them if they can have my hair treated for free (at least the 6 sessions I paid for to have my hair treated). wow!! I didn’t expect that you’re a Kpop fan!! And when you said that in the fashion industry there are many kpop fans!! It’s like “oh em gee!!!”. I, myself, is a kpop fan and i also love fashion!!! Of course! Kpop is adorable!